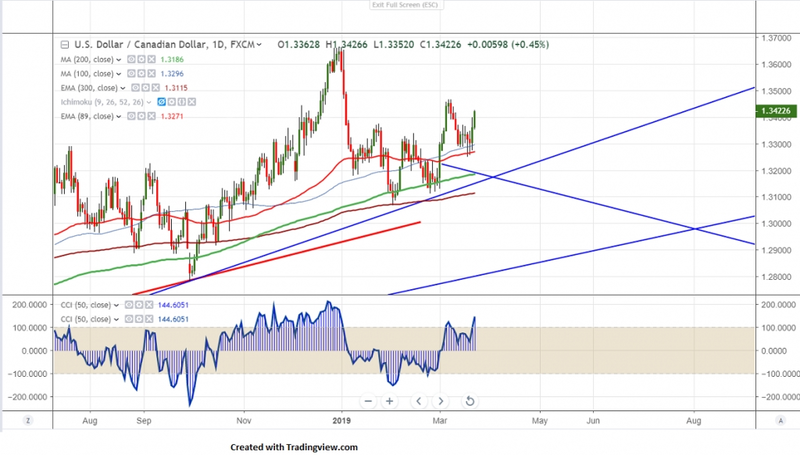 USDCAD halted its weakness after a more than 200 pips decline on account of rising crude oil price.The pair was trading higher amid dovish Fed monetary policy and jumped nearly 140 pips after dovish Fed. Canadian retail sales came at 0.1% for the month of Jan compared to forecast of 0.2% but better than previous month -0.8%.But CPI m/m came at 0.7% vs estimate of 0.6%. It hits high of 1.34265 at the time of writing and is currently trading around 1.34164. On the higher side,near term support is around 1.3438 (61.8% fib) and any violation above will take the pair to next level till 1.3500/10.35980. It should break above 1.3660 for further direction. The near term support is around 1.3380 and any break below will take the pair till 1.3340/1.3296 (100- day MA)/1.32500. It is good to buy on dips around 1.3380 with SL around 1.3340 for the TP of 1.3500.